I've explored Cougar Mountain Regional Wildland Park three times with the Auburn Senior Activity Center group, and each experience has been different. 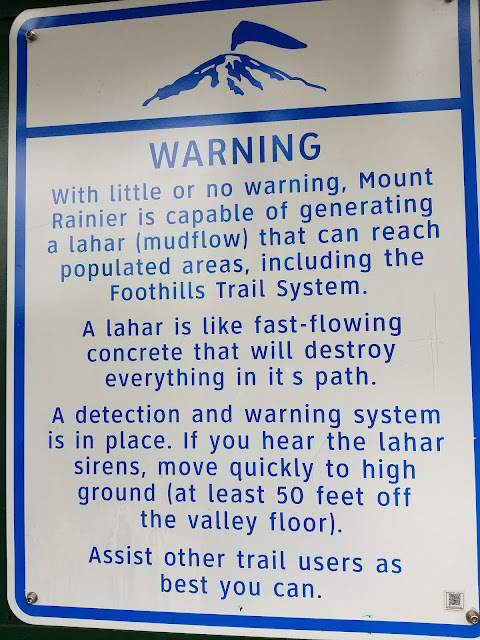 We always hike for a couple of hours and then stop at Coal Creek Falls for lunch in beautiful surroundings, but we take different trails and the hikes are never the same. For example, here are the falls in April, 2016. 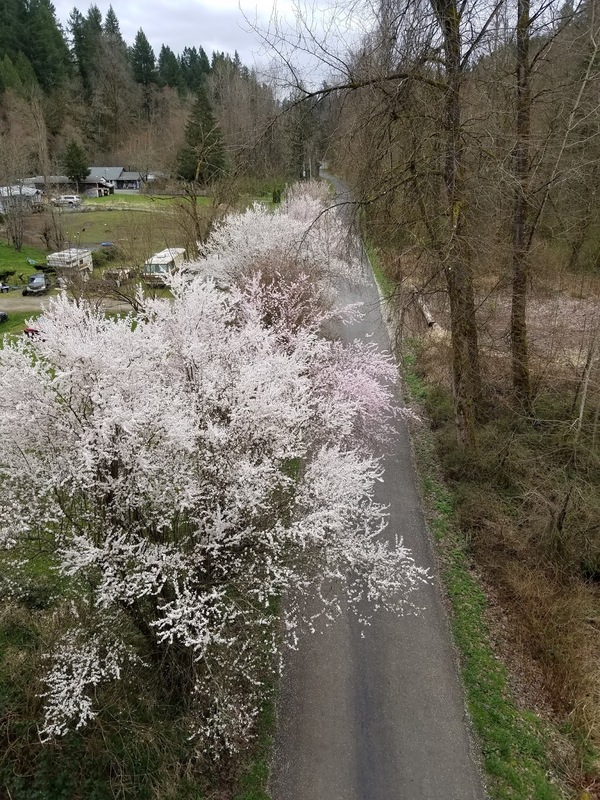 We'd had a dry winter and there was a lower-than-normal snowpack in the Cascade Mountains. The result: the danger of wildfires increased and water available for crop irrigation declined. Here are the falls during my April 20, 2018, hike. Much more dramatic! This year, quite a few trails were closed. 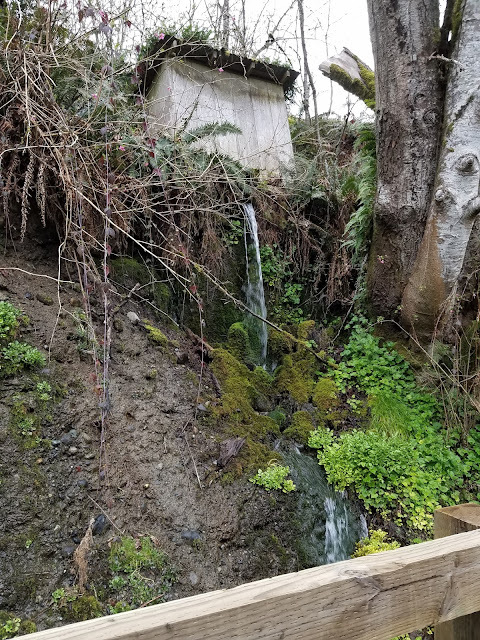 Our recent rainfall had turned some paths into streams--slippery and unsafe for hikers. We slogged through a few muddy patches and skirted mud puddles, but the trails we explored were fine. That day I logged eight miles on my Fitbit. (That included walking the grand-dog around our neighborhood.) A good workout. 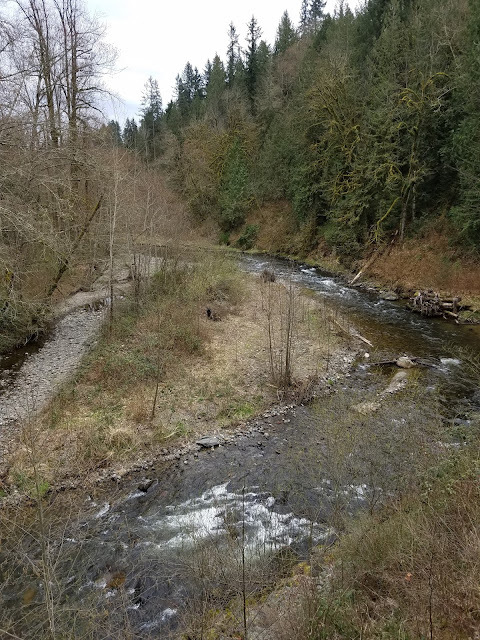 My previous posts about Cougar Mountain (located in the "Issaquah Alps") are HERE (2016) and HERE (2017) . When a terrible cold struck my son and daughter-in-law several months ago, I was called in to take my granddaughter to a birthday party at The Little Gym in Covington, WA. Here's a photo of one of the party's activities. I love a good series, and one of my favorites is the Karen Grace trilogy written by Lynne Morgan Spreen. The characters are mature - "older" but not "old" - and I can definitely relate to them. 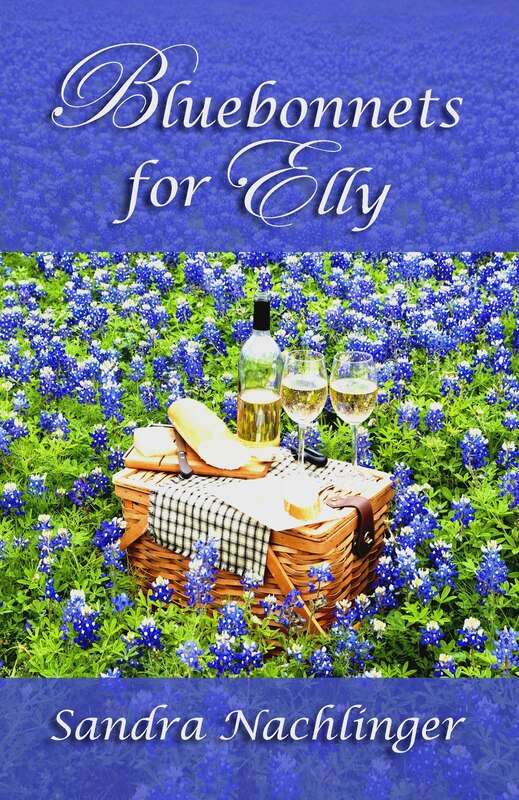 There's friendship, romance, drama, humor, and even a little danger in their stories. The relationships between the women ring true. 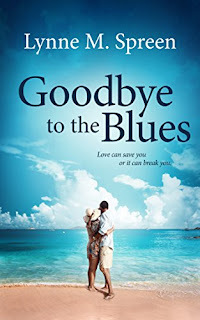 Today I'm featuring excerpts from Book 3 - Goodbye to the Blues. FYI: I posted excerpts from Key Largo Blues, the second book in the series, HERE. ⭐By the way, when I contacted Lynne and told her I planned to feature Goodbye to the Blues on my blog, she offered a giveaway - an audio version of Key Largo Blues. If you'd like to enter, just include your email address in your comments on today's post. I've also invited Lynne to respond to comments and questions. "Take an old rooster. Wring neck early in morning so meat can cool..."
I didn't plan to try that one. When we were introduced, he stuck out a sweaty paw and grasped my hand all the way up to my wrist. I would have had to been wearing a whalebone corset for my breasts not to jiggle. Disclosure: I received an advance copy of Goodbye to the Blues as a beta reader. 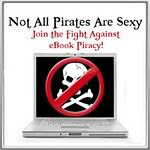 Then I bought a copy of the final version for my Kindle. Every woman needs a friend like Karen Grace. 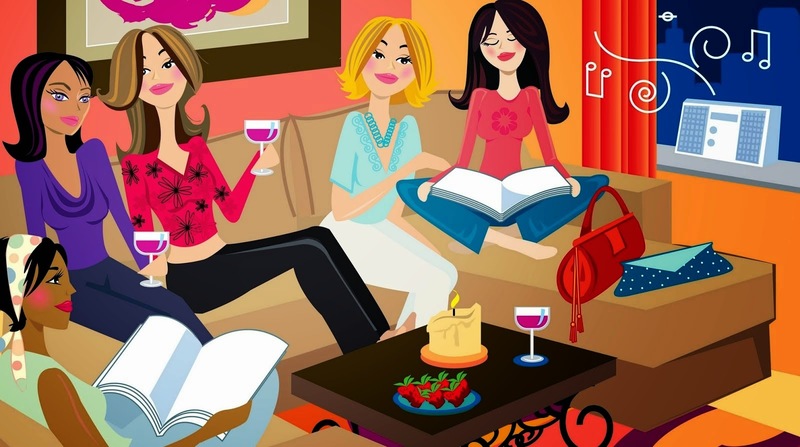 In this third book in the series, Karen travels from Palm Springs to Newport Beach to Denver reuniting with friends, all of whom struggle with matters of the heart. In Palm Springs, longtime couple Fern and Belle are on the verge of breaking up, but everyone knows they were meant for each other. Now in their late seventies, will Fern accept the truth about their relationship before it’s too late? 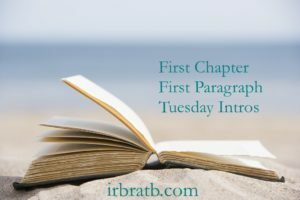 In Newport Beach, Rita, a fiercely independent trucker, must choose between the call of the open road and her devotion to Grady, who needs her now more than ever. In Denver, Jessie has managed to keep her troubled mother at arm’s length, but Sandy is desperate for reconciliation. While Jessie fights to protect her family, her marriage hangs in the balance. Caught up in the drama, Karen fears repeating her own mistakes. When she returns home to North Dakota, husband Curt drops a bombshell that threatens to tear them apart. Goodbye to the Blues is an upbeat testament to the power of love in all its forms. 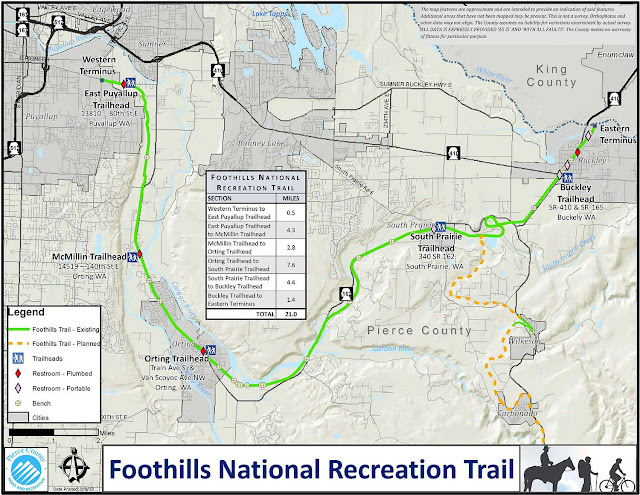 I've been on portions of the Foothills Trail before (blog post here), but this was my first time on the newly-opened section between the South Prairie and the Buckley Trailheads. We walked three miles along a paved surface, then turned around and retraced our steps on this easy hike. According to a Pierce County, Washington, website (here), the Foothills Trail sits atop an historic railroad bed. 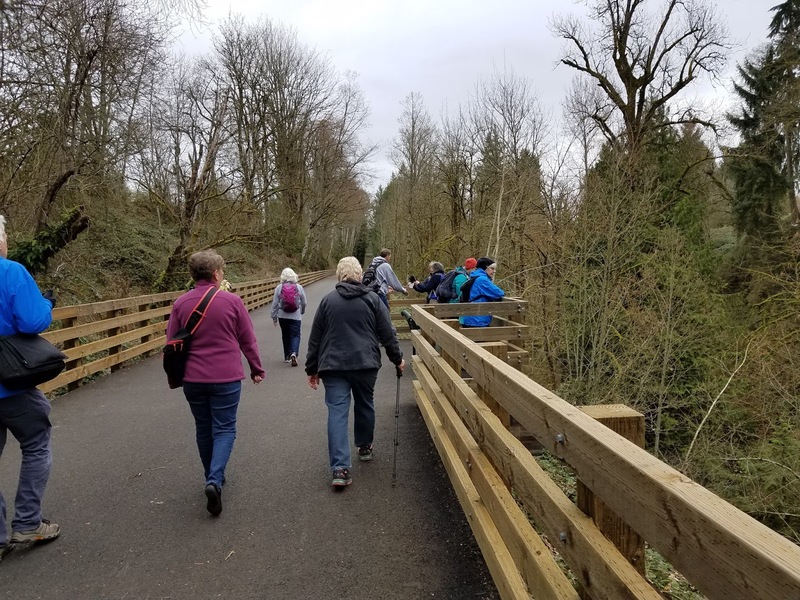 Another great rails-to-trails project. ... and crosses rivers and creeks. 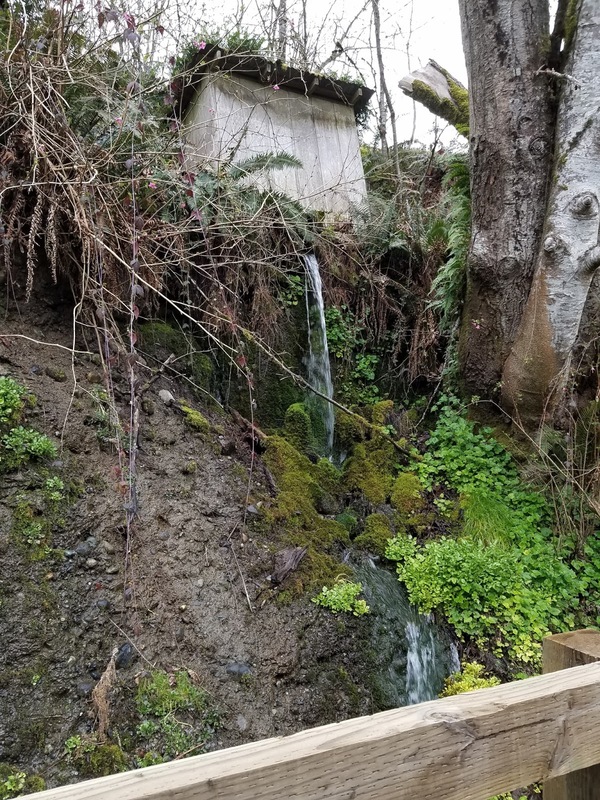 In settings where no natural spring is available, another source of natural running water, such as a small creek or diverted portion of a larger creek, might be used. In addition, some people put jars of milk in a bucket suspended by a rope in an "open-mouth" well during hot weather. Could that be a springhouse? FYI: Sasee Magazine published my personal essay "Happy When I'm Hiking" in its April edition. You'll find it HERE if you're curious about why I love hiking so much. 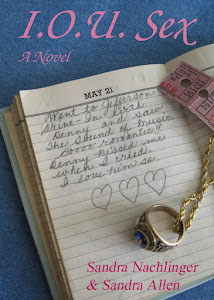 Hard to believe I'd never read a Mrs. Pollifax cozy mystery. Well, now I've read three. While recovering from the "crud" that's been going around my part of the country, all I did was read and recuperate. Mrs. Pollifax was good company and didn't seem to mind my coughing and sneezing. My only complaint is that this three-book, hard-backed tome was heavy! The three books are: The Unexpected Mrs. Pollifax, The Amazing Mrs. Pollifax, and The Elusive Mrs. Pollifax. My favorite was the "Unexpected" one, which is the first in the series. I have had this book on my shelf for years--probably bought from a Friends of the Auburn Library sale. The nurse walked out of the room, closing the door behind her, and Mrs. Pollifax looked at the doctor and he in turn looked at her. He was a very nice young man, with black hair, very white teeth and horn-rimmed glasses that he removed now, placing the stem of the earpiece between his teeth. "Well, Mrs. Pollifax," he said pleasantly, "I don't know how you manage it, but for a woman of your age you're in fantastically good health. I congratulate you." "Oh," said Mrs. Pollifax flatly, and the doctor glanced at her with such a peculiar expression that she added brightly, for his benefit, "Oh!" Even the homes that showed briefly in the glare of the headlights looked inhospitable, their rooftops barely seen over the tops of high walls that surrounded them. The walls were guarded by huge gateways with iron-studded doors--clearly not a trusting neighborhood, thought Mrs. Pollifax--and then they had left the town behind. 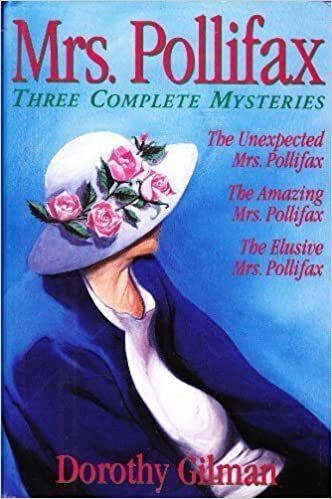 Synopsis (from Amazon): Here in one volume are three Mrs. Pollifax novels by the incomparable Dorothy Gilman. So curl up on the couch or in your favorite chair and follow the world's most unlikely secret agent on three missions filled with intrigue, danger and fun. Check it out! My personal essay "Happy When I'm Hiking" is featured in Sasee Magazine's April issue.